NPR’s Tiny Desk Concert Series is one of my favorite things, featuring studio concerts with amazing musicians over at the NPR offices. 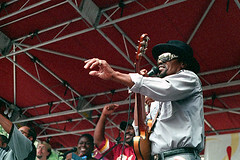 Most of the time it’s acoustic or indie, but this week, it feature’s DC’s own Go-Go style, with a Chuck Brown concert right at their offices. On a day that’s been fraught with frustration, with grief, with anger, it’s nice to have something purely and unabashedly awesome about this city to turn to. Thanks NPR. Thanks Chuck Brown.